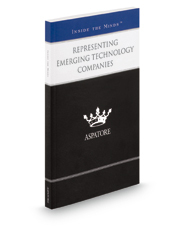 Representing Emerging Technology Companies provides an authoritative, insider's perspective on best practices for advising technologists, entrepreneurs, and venture capitalists who are considering, or in the midst of, a tech start-up. Partners from some of the nation's leading law firms guide the reader through the recent trends and developments that are influencing the post-recession economy. These top lawyers closely examine the most important issue impacting these companies – access to funding – and describe the many options becoming available. Further, these authors discuss the so-called crowdfunding portion of the JOBS Act, the part of the economic stimulus package enacted in response to the recent recession, and the SEC's recent promulgation of regulations implementing this and other provisions of the Act. Additionally, these experts analyze in great detail the “choice of entity” issue as a key factor in the technology start-up process, as well as the protection of the entity's critical intellectual property. The different niches represented and the breadth of perspectives presented enable readers to get inside some of the great legal minds of today, as these experienced lawyers offer up their thoughts on the keys to success within this dynamic field.